Secretariat Correspondent: Prime Minister Sheikh Hasina assumed her office on Sunday morning after formation of new government. She joined her first office in the Armed Forces Division. 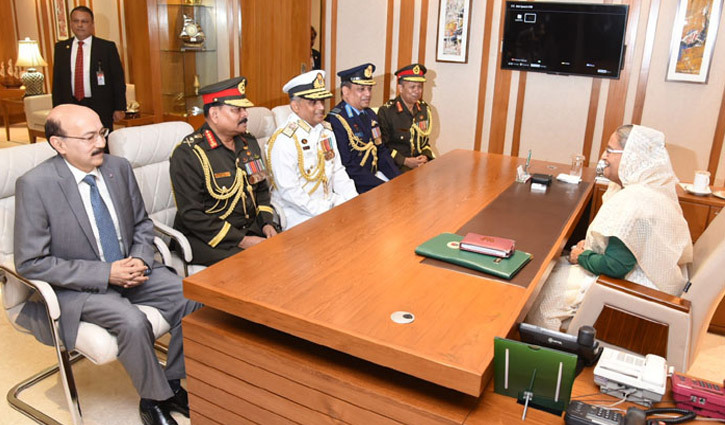 Lt Gen Mahfuzur Rahman, principal staff officer of Armed Forces Division, welcomed the Prime Minister when he reached her office in Dhaka Cantonment at 10:20 am. Prime Minister Sheikh Hasina exchanged views with officials of the Armed Forces Division. The chiefs of the Army, Navy and Air Force were present at the time. Earlier, Sheikh Hasina paid rich tributes to the martyred members of Bangladesh Armed Forces on the occasion of the assumption of her office as the premier for the fourth time. The prime minister paid the homage by placing a wreath at the Shikha Anirban (flame eternal) in Dhaka Cantonment. After laying the wreath, she stood in solemn silence for some time as a mark of profound respect to the memories of the martyrs, who made supreme sacrifices during the War of Liberation. A smartly-turned out contingent drawn from Army, Navy and Air Force presented a guard of honour at that time, while bugle played the last post.